Variety reports that Showtime is bringing back THE L WORD…this time as a reality series. Pay cabler has greenlit nine episodes of "The Real L Word: Los Angeles," from "L Word" creator Ilene Chaiken and reality producers Magical Elves ("Top Chef"). Show will follow six lesbians in Los Angeles as they go about their lives — a lesbian answer to Bravo's "Real Housewives" franchise. Project is dependent on casting, the net said; if all goes as planned, "The Real L Word" would debut sometime next year. If this works, the reality versions of DEXTER and THE TUDORS should be fun. I hate it when we're asked to vote for new WGA officers and board members. We get inundated with mails, each side attacking the other, and then we get that bulging election packet, with its candidate statements, candidate rebuttals, rebuttals of rebuttals, rebuttals of rebuttals of rebuttals, the non-candidate statements, the rebuttals of non-candidate statements, and the endorsement ads. Accusations, counter-accusations, and counter-counter-counter accusations. I don't bother with most of that crap. I read nothing but the candidates statements and make my decisions based on that, my personal knowledge (if any) of the individual candidates, and my own take on where the industry stands and what I believe the direction of the Guild should be. I do not vote according to slates. I vote according to a candidate's principles, experience, ideas, and vision. But most important of all, I vote. If you are a WGA member, I urge you to vote as well. Board Members: Patric Verrone, Howard Rodman, Carleton Eastlake, Dan Wilcox, Ian Deitchman, Linda Burstyn, Chip Johannessen, and Luvh Rakhe. 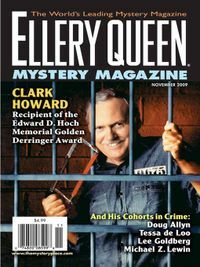 My “novelette” The Case of the Piss Poor Gold appears in the November issue of Ellery Queen Mystery Magazine, which is shipping to subscribers now and will be available at newsstands across the country next week. The story is an excerpt from my upcoming novel MR. MONK IN TROUBLE and is a “standalone” mystery featuring Adrian Monk’s ancestor Artemis Monk, an assayer in the California gold rush town of Trouble in the 1840s. The book is set in the present day, but Adrian finds some startling similarities between the murder he’s solving now…and some of the cases Artemis investigated. The story in EQMM is about one of those cases. I had a lot of fun writing the “Western Monk” stories in the book…but I couldn’t have pulled it off without help from western pros like Richard Wheeler and Ken Hodgson, who kindly answered my dumb questions and reviewed my rough draft. I hope you enjoy the story now and the book in December! 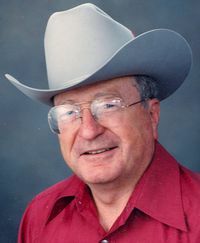 I just learned the terrible, sad news that one of my favorite authors, legendary western novelist Elmer Kelton, passed away this morning. He's considered one of the greatest writers of westerns ever…in fact, he was named the number one western writer of all time by the Western Writers of America, which has honored him with seven Spur Awards for Best Novel. His best known work is probably THE GOOD OLD BOYS…thanks to the Tommy Lee Jones movie version… but his many memorable novels include THE TIME IT NEVER RAINED, THE SMILING COUNTRY, HONOR AT DAYBREAK, SLAUGHTER, THE DAY THE COWBOYS QUIT, and his "Texas Rangers" and "Sons of Texas" series. I don't think he ever got the credit and recognition he deserved outside of the western genre and that's a damn shame. His books weren't just great westerns…they were terrific novels by any measure. I was lucky enough to meet him once, a few years back, when he was in Los Angeles and found him to be a gracious, friendly, and funny man. He will be missed but I'm convinced that his work will continue to captivate, entertain, and enlighten readers for generations to come. UPDATE: Bill Crider,a top-notch western writer himself, remembers Kelton. 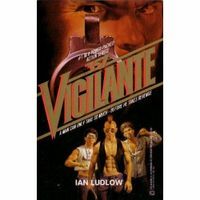 .357 Vigilante, the first book in my long out-of-print paperback series, is now available in a Kindle edition. A Man Can Only Take So Much…Before He Takes Revenge. He lost a father, a friend, a whole way of life…now he's looking for justice down the barrel of a gun. Brett Macklin was a freewheeling son of sunny California, a collector of vintage cars and a connoisseur of beautiful women. But when his father is gunned down by a street gang, Macklin becomes something else — a deadly weapon against crime. He won't stop until he's wiped out the rapists and killers who have turned Los Angeles into a war zone. The sequel, .357 Vigilante #2: Make Them Pay is also available on the Kindle….and will soon be followed by the other books in the series. Variety reports what I've been hearing from TV writer friends for months…writing staffs are shrinking dramatically. "I definitely feel as if there are (fewer) jobs out there," says Damon Lindelof, exec producer of ABC's LOST. "Whereas new shows from pilots that got picked up used to have 10 to 12 writers — that was the size of our staff in 2004 — we're just eight now. […]William Rotko, exec producer of the FBI-themed Patrick Swayze starrer THE BEAST, which finished its one-season run for A&E, says a confluence of events has altered the TV dynamic. "I don't know if it's a combination of the recession and the prior writers' strike," he says. "They kind of landed one after another. After the writers' strike, it seemed this was going to happen anyway, but the recession sped up the process of reducing the size of the writers' room. There are also fewer scripted shows than there were in the past. The major networks have all given up offering new, scripted fare on Saturdays, there's more reality shows than ever, and NBC has scrapped five hours of prime-time for Jay Leno's new show. While cable has picked up some of the slack by producing original dramas, they are short orders with small staffs. It all adds up to the worst job market for TV writers than I have ever seen before. It's shocking to me how many of my friends…experienced, successful scribes, some with shelves of Emmy Awards… are out of work right now. Variety reports that Neil LaBute will write and direct an adaptation of Charles Willeford's novel BURNT ORANGE HERESY. It's not Willeford's best novel, but I'm glad to see any of his work make it to the screen. Past adaptations have been a mixed bag… COCKFIGHTER and WOMAN CHASER were great, MIAMI BLUES was a major disappointment. The Bookseller reports that a judge has thrown out a lawsuit by so-called "literary agent" and vanity press "publisher" Robert Fletcher against Writer Beware and ordered him to repay Victoria Strauss and Ann Crispin all of their legal costs. Judge Thomas Connolly, who ruled that Fletcher and his company were liable for the costs, said: "The plaintiffs have exhibited extreme bad faith in bringing this frivolous lawsuit for the sole purpose [of] causing great expense and harassment to Crispin and Strauss… The court concludes and finds that this case was brought in bad faith by the plaintiffs." The judge added that Fletcher's purpose was "not to prevail in the lawsuit but just to bankrupt the defendants". […]Fletcher claimed the blogs "alleged fraud, misrepresentation and dishonesty towards authors" and were "defaming and libeling" by "publishing warnings to potential authors of the fraudulent practices of LAG and Fletcher". Fletcher operates a fee-charging literary agency/writers' consultancy under a variety of names. I hope this will serve as a warning to others like Fletcher, and there are many of them out there, who think they can intimidate Writer Beware and prevent them from warning writers about deceptive publishing practices. It's also my hope that more organizations will join the Science Fiction Writers of America and the Mystery Writers of America in sponsoring Writer Beware…and that the support of major writers' organizations will frighten off scammers from filing frivolous lawsuits against the site. Voice actor Phil Proctor gave a ringing endorsement to Owensboro’s International Mystery Writers Festival in accepting his Angie Award for best featured actor in “Three Blind Mice” on Sunday night at the RiverPark Center. The third annual festival downsized because of the closing of the Executive Inn Rivermont — and the resulting hotel room shortage — and construction along the riverfront. “Personal Call,” a Christie work first performed on the BBC Radio Light Programme on May 31, 1954, won top honors at the festival. The Angie Awards are named for actress Angela Lansbury, who was honored with the festival’s first First Lady of Mystery award in 2007. Travis Estes, the center’s director of sales and marketing, said the festival drew more people than had originally been expected. 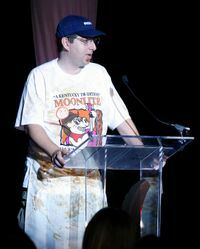 David Breckman, a writer, producer and director for the TV show “Monk,” wrote and directed a 10-minute film, “Murder in Kentucky,” during the festival. 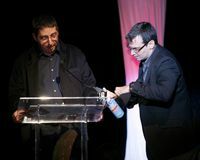 Lee Goldberg, a writer for such shows as “Monk” and “Diagnosis Murder,” was master of ceremonies for the awards show. He came out in a stained Moonlite Bar-B-Q Inn T-shirt carrying a plate of bones. Gary Sandy, best known for his work on the TV series “WKRP in Cincinnati,” was named best actor. Rupert Holmes’ “You’re the Thorn in my Side” was named best song of the festival. David Ossman was named best director. 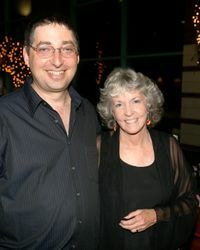 Novelist and Louisville native Sue Grafton was named First Lady of Mystery for her work as a novelist in the Kinsey Millhone mysteries — “A is for Alibi, “B is for Burglar”… . Secretary of State Trey Grayson commissioned 10 people who have appeared at all three festivals as Kentucky Colonels. Special Angies went to the city of Owensboro, Daviess Fiscal Court, line producer Judith Walcutt, Breckman, Goldberg and David Dial of WNIN-FM in Evansville, which has broadcast the radio plays. 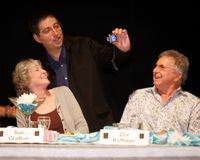 The festival is the brainchild of Zev Buffman, RiverPark president, who produced more than 40 Broadway shows and 150 national tours of Broadway shows early in his career. My wife saw it and said “I’m so glad you didn’t make a fool of yourself while you were there.” My daughter’s reaction: “Only people in Kentucky will see that, right? It’s not going to be in our newspaper is it?” Me, I loved it.